New Orleans is a city of weather, a place where the skies can open up and rain buckets down especially during the steamy summer months. If you find yourself caught in a New Orleans shower, there are endless indoor activities all over town that will keep you entertained until the sun comes out again. 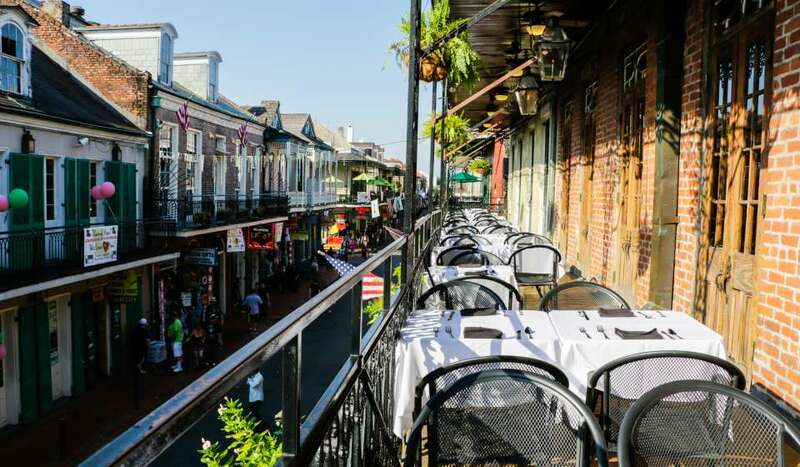 The gorgeous French Quarter is the perfect place to walk between the raindrops, thanks to cover provided by lacy wrought iron balconies and galleries that give shelter to passersby. 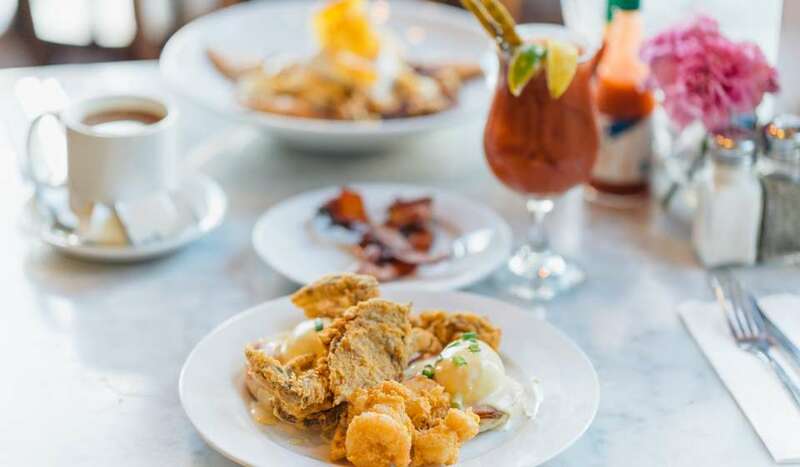 Breakfast – Dip into Stanley, the perfect breakfast spot for classic Southern brunch specialties inspired by Tennessee Williams’ A Streetcar Named Desire in Jackson Square. Movies – See what’s playing at The Theatres at Canal Place, an intimate movie experience that includes cushy seating and a full menu of food and spirits. Shopping – Spend the day at the Outlet Collection at Riverwalk or the Shops at Canal Place, both havens for upmarket brands and iconic designer boutiques. Or spend the afternoon getting lost amongst the extensive (and eccentric) collection of antiques, jewelry and artwork at M.S. Rau’s Antiques, which almost feels more like a museum than a store. Lunch – Located inside a restored 1794 cottage, The Gumbo Stop is a great venue to experience traditional and contemporary Creole cuisine. Aquarium – Get up close and personal with more than 15,000 sea creatures at Audubon Aquarium of the Americas, located along the Mississippi River at the foot of Canal Street on the edge of the French Quarter. 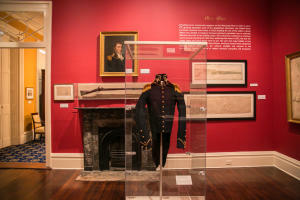 Museums – There are many great places to explore indoors, notably The Cabildo, Beauregard-Keyes House, the 1850s House, and the Historic New Orleans Collection. Drinks – Have a classic New Orleans cocktail at the revolving Carousel Bar in the Hotel Monteleone, the famed watering hole frequented by the likes of Tennessee Williams, William Faulkner and Truman Capote. 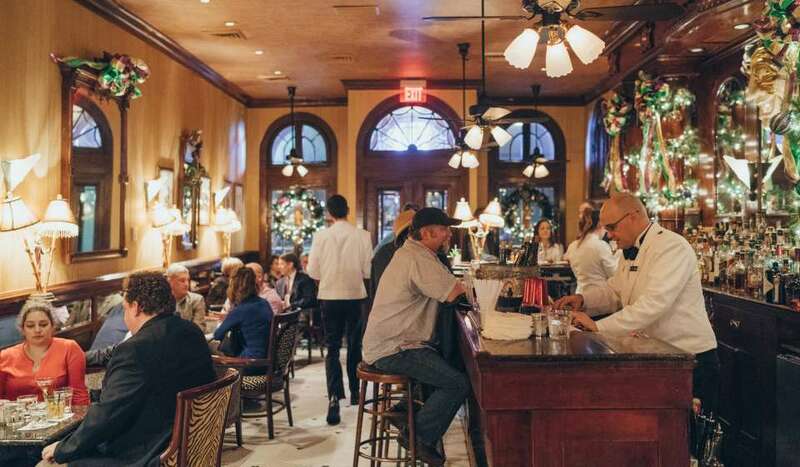 Dinner – Savor an unforgettable New Orleans fine dining experience at Antoine&apos;s, known for its gorgeous interior and classic Creole menu, or try one of our other famous favorites, Mr. B’s, Galatoire’s or Arnaud’s – all revered for wonderful food and stately décor. Known for museums, industrial architecture and a growing restaurant scene, the Warehouse Arts District and CBD are hotspots in stormy weather. 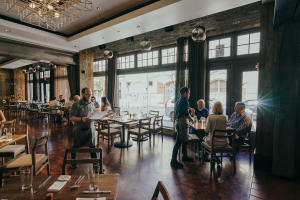 Breakfast – Willa Jean serves a savory southern-contemporary menu, with favorites including fried chicken on a biscuit and chocolate chip cookies with a side of cookie-dough and vanilla-infused milk. Oh my. Museums –The National World War II Museum is a fabulous way to spend the day. Ranked by TripAdvisor as No. 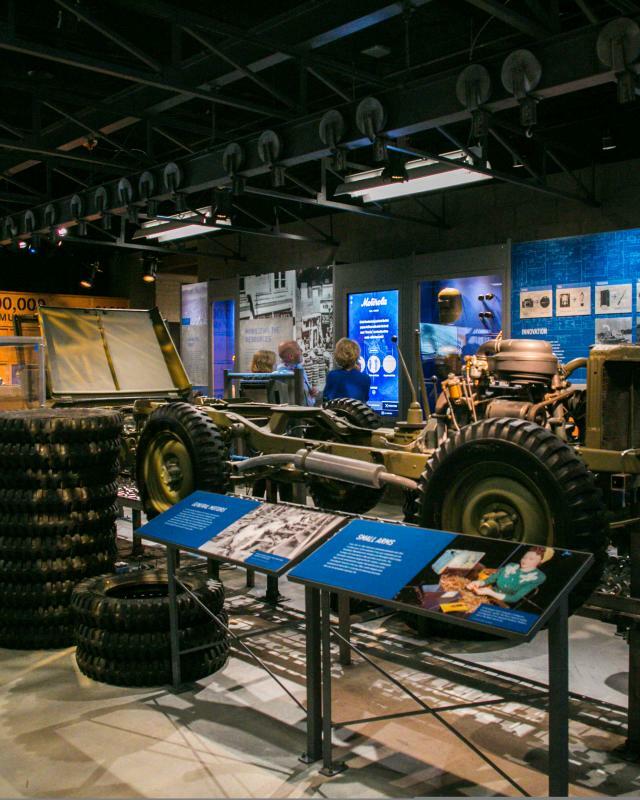 4 in the top 25 museums in the United States, this profound tribute to America’s Greatest Generation overflows with galleries and artifacts that bring history to life. Or if you’re looking for a more artsy experience, check out the Ogden Museum of Southern Art, which dazzles visitors with art from 15 Southern states and the District of Columbia. Lunch – Peche Seafood Grill is a destination restaurant for any seafood enthusiast, with a raw bar and an extensive menu of Gulf seafood grilled over an open wood fire. Yoga and Wellness – Once you digest, take a class at Reyn Studios Power Yoga, an inspiring escape from the rainy weather. Practice in a spacious wood and exposed brick space sure to leave you feeling fit and empowered. Dinner – Located in a renovated pharmacy warehouse in the Arts District, Emeril&apos;s is a charming place to weather any storm. Sit at the food bar overlooking the open kitchen for the best view of chef Emeril’s team of culinary wizards at work. And definitely order the barbecue shrimp. In the mood for small plates? One of Emeril’s other restaurants, Meril, is just around the corner with his signature food and a wide selection of delectable cocktails to sip as the rain falls. Uptown offers a raft of indoor activities during stormy weather. Breakfast – Whether you’re a donut-fanatic or biscuit sandwich devotee, District: Donuts. Sliders. Brew. will satisfy your breakfast cravings. The Garden District spot fries up donuts in fetching flavors like Salted Dulce de Leche and brown butter and other sublime ingredient combinations along with its breakfast and beer menus. Tours – For a one-of-a-kind look into the magic of Mardi Gras, visit Mardi Gras World on the Uptown edge of the Port of New Orleans. Or swing by NOLA Brewery to get an up-close look at the crafting of some of the city&apos;s favorites beers. Lunch – Just because the sun isn’t shining, doesn’t mean you can’t enjoy a po-boy. Family owned and operated, Domilise&apos;s is famous for its fried shrimp and fried oyster sandwiches, dressed of course. Movies – Catch a flick at Prytania Theatre, New Orleans’ historic single-screen theater that shows new, classic, family and indie films. Dinner –Brigtsen&apos;s is a cozy dinner spot by the river offering a diverse menu with a New Orleans twist. 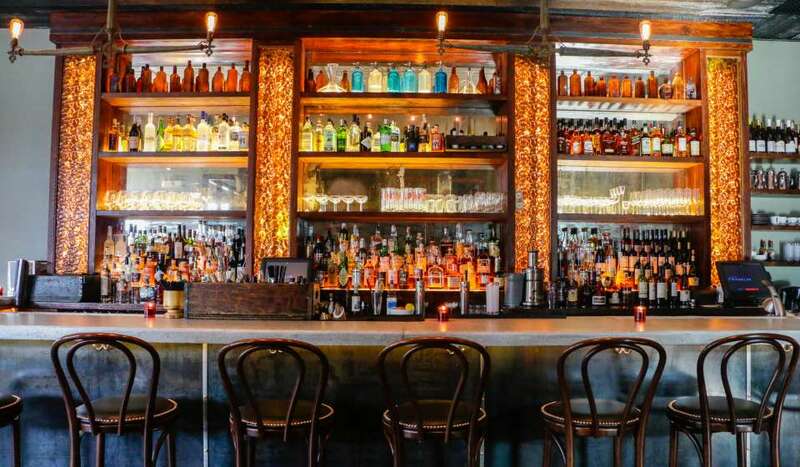 Or try the Rum House, Basin, and other casual, homey restaurants on Magazine Street. Music – Stay indoors and get down to some of New Orleans’ best local tunes at Tipitina&apos;s or Maple Leaf Bar. 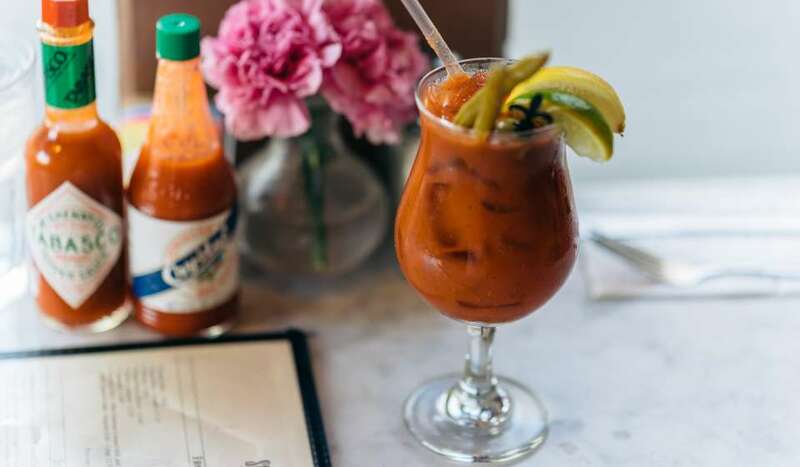 Drinks – There are few more magical places to catch a midsummer rainstorm than from the comfort of The Columns Hotel’s covered front porch overlooking St. Charles Avenue. Craft cocktails at Cure on Freret Street is another splendid option. Mid-City offers a neighborhood vibe filled with funky local treasures. Breakfast – The Ruby Slipper Cafe is an ideal spot to wait out a storm. 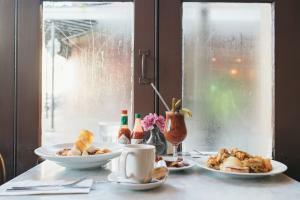 Enjoy decadent brunch dishes and sip on specialty breakfast cocktails while you wait for showers to pass. Museums – Come see the incredible collection of paintings, sculptures and art from around the globe at the New Orleans Museum of Art. The museum is ranked among the top 25 percent of the nation’s largest and most significant museums, making it a treat for any New Orleans visitor. Once the storm passes, be sure to check out the neighboring Besthoff Sculpture Garden, which offers free admission seven days a week. There is also the Edgar Degas House Museum honoring the artist who lived there. Lunch: Cooking Class – Grab a friend and sign up for a cooking class at The New Orleans Cooking Experience, which offers personalized cooking classes focused on authentic Creole dishes. Bowling – Hide from the showers at Mid-City Lanes Rock &apos;n&apos; Bowl, where you can rock out to live music, enjoy a full bar and bowl with your friends or family. Dinner – Grab a table at Lola&apos;s with a group of friends and split the paella, along with a pitcher of delicious red wine sangria, or dine at Zasu, a cozy shotgun house converted to a restaurant with a menu that combines local and international ingredients. From local art to dining and live music, the most eclectic gems in the city can be found in the Faubourg Marigny and Bywater neighborhoods. Breakfast – Forget about the weather over breakfast at Elizabeth&apos;s, an art-filled brunch spot known for copious portions and praline bacon. Art – Browse Dr. Bob Folk Art studio and gallery, where you can view and purchase the local artist’s distinctive creations. This is the guy behind the “Be Nice or Leave!” signs you see all over town, along with scenes of the Bayou, local colorful characters, and spirits of the Crescent City. Wine connoisseurs will want to make their way to Second Vine Wine and toast the rain away with their expansive array of fine wines and cocktails. Sip & Sew classes featuring live Mardi Gras Indian performances and interactive creation making takes place every Sunday at 1 p.m, 3 p.m. and 5 p.m. Book your group session for a day in. Shopping – Check out funky Bywater shops like Euclid Records, an independent record store with a fabulous selection. Lunch – If you love barbecue, look no further than The Joint for a smoky rainy day lunch. The restaurant’s slogan “Always Smokin’” is the truth. Dinner – Check out a menu that pleases all at Cru. Paladar 511 is a super pick if you’re looking for Mediterranean and Italian fare with seasonal, local ingredients. 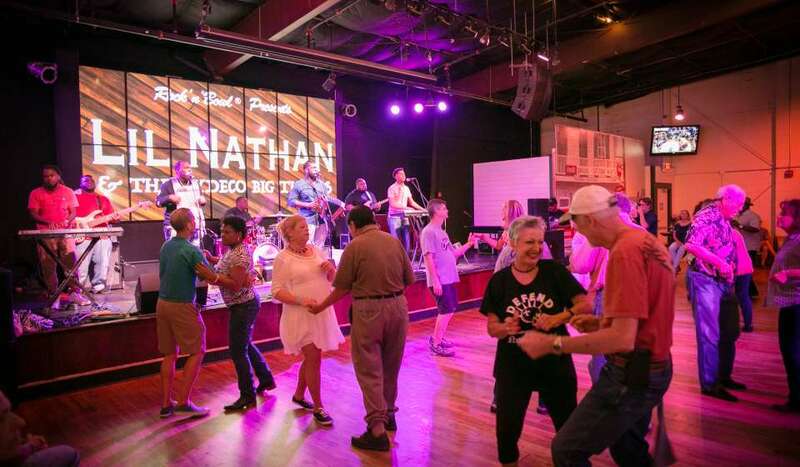 Drinks and Music – A little rain can’t stop the funk at Vaughan&apos;s Lounge and Hi-Ho Lounge and Bar Redux, three great spots to dance the rainy night away.